Welcome to 10 Redden ct. 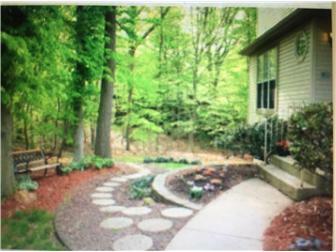 Located in the desirable community of The Village of Becks Pond. A lovely End Unit located in a cul de sac with an extra long/wide driveway, Secluded by mature trees. Unique layout with a side entry door that flows into living room / dining room. This space would also make a large Great room. The kitchen is very spacious, which leads outside to a Beautiful Deck for your gatherings, Summer BBQ. The upper level has 3 nice size bedrooms. The master bedroom Suite has a vaulted ceiling, Garden tub, Shower & walk in closet. The laundry room is located on the upper level. The lower level family room is spacious & great for entertaining/ Recreation/Media room with storage closets. which leads out to a private patio & yard. Conveniently located~ close to Shopping, Restaurants, Parks & major highways…..Tour & Make an Offer today!